Curated by Dr. Alka Pande,India Habitat Centre, New Delhi, in collaboration with Thomas Imboden, CrossCulture, Switzerland. The project aims at continuing and deepening a cross cultural dialogue in an attempt to build bridges and conversations, and also interrogate cultural differences through site specific art works. It is a search for connecting as well as dividing cultural phenomena, and the subsequent research into their backgrounds through creative expression. 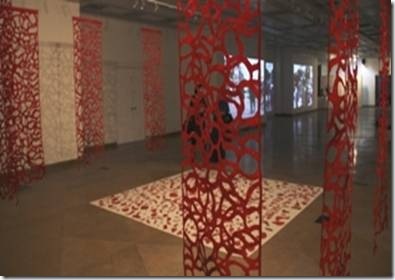 The video shows the sari mala created in Varanasi in different distinct geographies connecting different living conditions: Varanasi in India, Salvador da Bahía in Brazil, and Zurich in Switzerland. The artist’s static performances lead the viewer’s attention to the movements around her, and to the small stories that occur within the frame of the camera. They intertwine on the acoustic level to a complex tapestry across spaces. Nesa Gschwend was raised in the Rhine Valley in Switzerland. She was educated at the Art & Design University of Zürich, Switzerland in scenographical design. In 2010 she won the Metron Art Prize. She has staged many performances, installations, exhibitions in several countries. She works and lives in Switzerland.